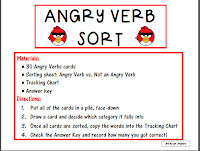 I was SO excited to post today, because I will be sharing a great activity that I SWAPPED! 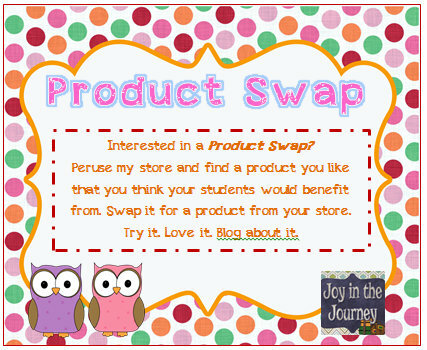 What's a Product Swap, you may ask? Well, it's simple: Peruse my TpT store and see if there's a product you'd like to try. Then, I'll find something to try with my kiddos and we'll SWAP! We test out the activities in our classroom, take pictures, and give it some blog love! 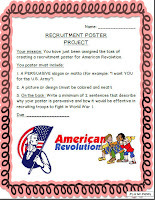 A couple of weeks ago, I swapped with the fabulous Holly from "Fourth Grade Flipper"
You can read her review of my War Recruitment Posters HERE. AWESOME product, chalked-full of FUN! 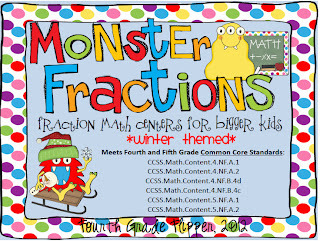 Holly swapped me her "Monster Fractions: Four Fraction Centers for Big Kids"
This excellent packed includes FOUR awesome, engaging, and easy-to-use centers that review FRACTIONS. 1. "Finding Freaky Equivalent Fractions"-Students use the task cards to find the number they must multiply the numerator and denominator by to complete the equivalent fraction. 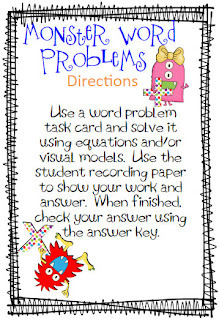 Student directions and an answer key to check answers are included. 2. "Monster Half Smack"-Students play a game where they place cards with fractions greater than or less than 1/2 on a board. When a fraction card is flipped that is equal to 1/2, the first player to smack the card keeps it. 3. "Monster Matchmaker"-Students play the memory game or go fish with the fraction cards that have a numerical fraction listed with a visual model. Students must match fractions that are equivalent. Student directions and a visual fraction bar model are included for students to check their answers. 4. 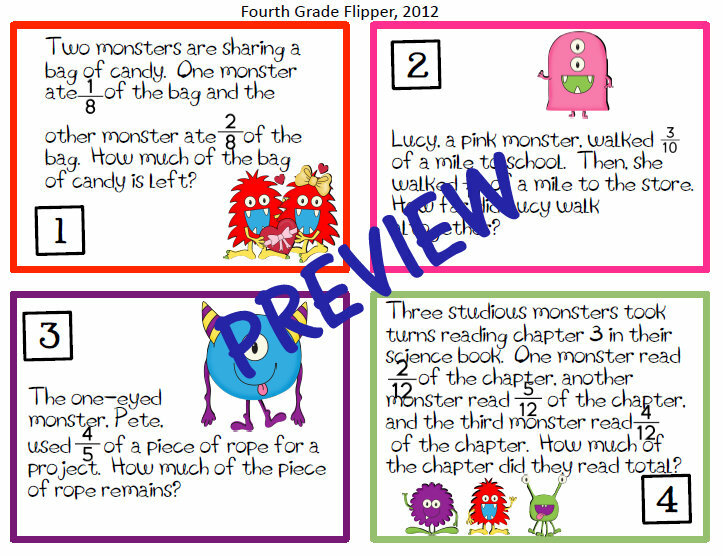 "Monster Word Problems"-Students use the task cards to solve word problems with fractions. Cards have word problems that involve adding and subtracting fractions with like denominators, multiplying a fraction by a whole number, and adding and subtracting fractions with unlike denominators. Each task card has a separate answer key with the equation and method of solving the problem modeled. 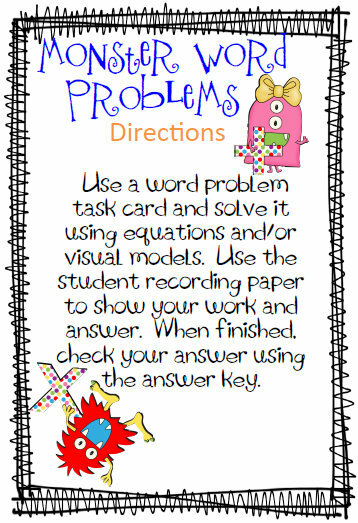 Directions and student sheet to record answers and work are also provided. I used the centers to prepare for THE test - they were a great review of basic fraction concepts that my kids had learned and would need to know. 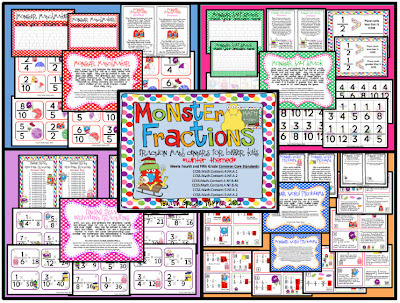 During testing week, I would treat my kids to "free" center time (where they could choose the games they wanted to play) in the afternoons, and so many of them begged for these Monster Fraction games! Well...what are you waiting for? Head on over to Holly's TpT store and pop this puppy in your cart! Interested in a Product Swap? 1 MORE DAY TIL SPRING BREAKKKKKKKK!